THIS IS NOT A HEATER! THIS PRODUCT IS ONLY AN UPGRADE! 1. Order the regular 110V version of our heaters and then shop locally for a voltage transformer to 220/240V. Make sure it is a transformer and not just a plug adapter which will cause the mat to burn out. This requires no additional payment for the heater but the client must find something locally and KKamp is not responsible for faulty transformers. This is the ONLY current option for the Ferment Friend - our apologies that it is not available in a hardwired version at this time. 2. Alternatively, we can make the Essential Heat Strip or Year Round Heating System with Dimmer with special materials, the proper plug for 200V systems for this $35 upgrade charge. All heaters are 4" wide and 24" long. The Essential Heat Strip simply plugs into the wall whereas the Year Round has the dimmer switch for dialing up or down the temp as needed. 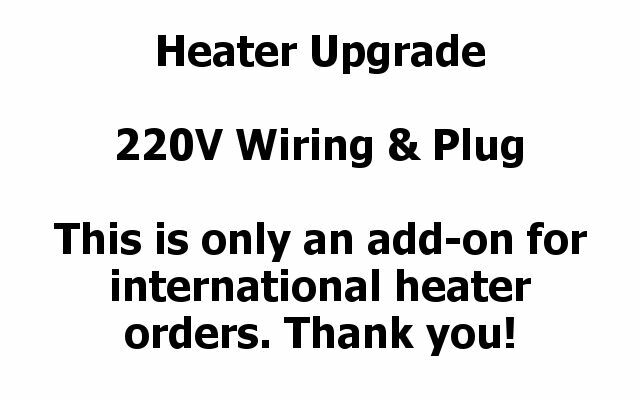 PLEASE ONLY PAY FOR THIS PRODUCT IF YOU HAVE ALREADY ORDERED A HEATER TO GO WITH IT AND DID NOT SELECT THE INTERNATIONAL UPGRADE. OUR APOLOGIES THIS UPGRADE PRICE IS NOT CURRENTLY AVAILABLE WITH THE FERMENT FRIEND.